Norfolk Seafood Company & Big Easy Oyster Bar, centrally located in Downtown Norfolk, features fresh local seafood with a cajun creole twist. This unique bi-level restaurant, nestled in an exquisite 20th century building, offers an atmosphere to meet all of your dining needs. Downstairs, you will find a casual environment featuring a fully stocked Mahogany bar, raw bar with fresh oysters and the best happy hour in town. Upstairs, an elegant dining room perfect for a romantic date or a quiet business dinner. The menu features both local & traditional cajun fare including seafood combinations with lobster, scallops & crab, jumbo lump crab cakes, seafood jambalaya & etouffee. Do not forget to save room for our beignets that have been compared to the famous Cafe du Monde in New Orleans. 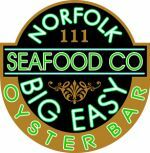 Norfolk Seafood Company & Big Easy Oyster Bar is conveniently located a stones throw from the The Wells Theater, home of The Virginia Stage Company, making it an ideal choice for dinner before a night at the theater. Open Daily at 4pm – 4pm- 7pm Happy Hour in the Bar & Lounge. Full Service Dinner Begins at 5pm.